Opendoor Studio: Etsy Project Embrace! If you don't know about it... you should! Etsy Project Embrace! If you don't know about it... you should! My friend Jean of 3squares.etsy.com included my Art shop pleinairpainter.etsy.com and more specifically, my " Kansas Mainline " painting. Her lovely treasury was throughly "peacocky" ! 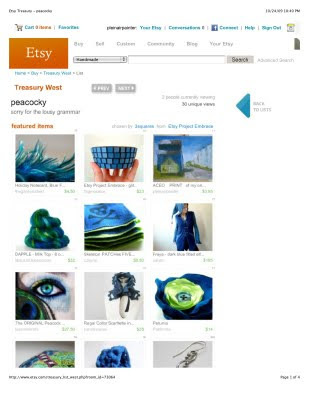 Jean coined that one while creating a beautifully blue and green treasury. The main intention of the treasury, however, was to support Etsy Project Embrace, an ever growing group of Etsians who together are supporting the fight against cancer. Feel free to join us on this Thread, by sharing your experiences, giving out healing energy to those who need it and posting any EPE related information including Treasuries, blog posts, donation listings, announcements, etc….. or just a friendly post to say “Hi!”…. " You can help fight cancer by making a donation to the American Cancer Society. I know we have all been touched by cancer one way or another... a parent, friend, loved one, or ourselves! Please consider giving a gift... the gift of research...of HOPE ...of a CURE!!! What a wonderful group of creative women! I am hopeful that I will become a member in the near future!